The Jarvis Model OGC – pneumatically powered oil gland removal system for chickens, fowl, and turkeys. The Model OGC is the most precise tool for oil gland removal – an exact cut ensures no excess material is removed, therefore increasing yield. Easy to use – reduces the need for skilled labor. 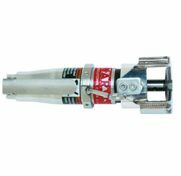 Lightweight – only 2 lbs (0.9kg) and can be balancer hung, removing all burden from the operator. Constructed of corrosion resistant materials for easy cleaning and optimum hygiene.